KUALA LUMPUR: Country Garden Pacificview Sdn Bhd, the developer of the controversial Forest City Project off the coast of Johor, has bowed to pressure from environmental concerns and reduced the scale of the mega project, which initially spanned 1,977.7ha, by 30%. This has effectively lowered the project’s estimated gross development value (GDV) by 25% to RM450 billion. “At 4,887 acres (1,977.7ha), we estimated it (GDV) to be RM600 billion. With the reduction of size by 30% to 3,425 acres now, the GDV is around RM450 billion,” Country Garden Pacificview executive director Datuk Md Othman Yusof told a media briefing here yesterday. He said the reason for reducing the scale of the project, which is to be entirely built on four separate reclaimed islands, is to preserve the sea grass at the development site. It was also announced at the briefing yesterday that work on the Forest City project, which lies close to Singapore, will recommence, with its completion due sometime in 2045. The company said Forest City’s four islands will be reclaimed in four phases (Island 1: 979 acres; Island 2: 1,896 acres; Island 3: 405 acres; and Island 4: 145 acres). The topside development will be developed concurrently during the reclamation phase of each island. The 66:34 joint venture project between one of China’s largest developers, Country Garden Holdings Ltd, and Esplanade Danga 88 Sdn Bhd, whose main shareholder is the Sultan of Johor, was stalled for eight months since June 16, 2014. 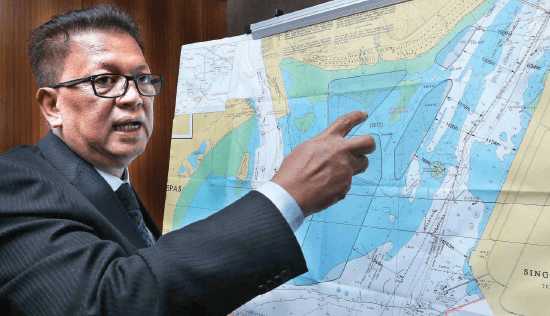 This is because the project had drawn objections not only from Singapore — the republic was said to have voiced its concerns over the project in two diplomatic notes to the Malaysian government in July last year — but also from Johor residents, particularly its fishermen, who had complained of shrinking catches and mass fish deaths since reclamation for the project began. During a public dialogue on Sept 21 last year, residents had accused Country Garden Pacificview of bulldozing the project through. The public outcry notwithstanding, in January this year the Department of Environment (DoE) approved the project’s detailed environmental impact assessment report, even as Tanjung Kupang villagers argued that it would lead to the loss of their land and livelihoods. Approval was also given for its Environment Management Plan in February. In a recent interview with a local daily, the Sultan of Johor Sultan Ibrahim defended the controversial project, saying that the investment was good for the state’s coffers. Yesterday, Md Othman said the company has complied with all the necessary requirements set by the DoE, and that it has spent RM2 million to build two layers of 4.84km-long silt curtains to guard against pollution that could affect the sea grass in the area, which is the habitat of the rare golden seahorse. In addition, he said the second island will have to be reduced by some 300 acres as it overlaps with the anchorage area where ship to ship transfer activities take place. “We are not only monitored by Malaysia’s DOE, our neighbouring country (Singapore) will also closely monitor us,” he added. Previously, when confronted with the mass fish deaths, Country Garden Pacificview had called on the authorities to investigate the matter and urged the public not to speculate on the cause of the phenomenon. To mitigate the project’s effects on the livelihoods of fishermen in the area, Md Othman said yesterday that the company had provided RM3 million to the fishermen in the area, which he termed a form of corporate social responsibility, in March last year. The money has already been distributed. He said the project is also expected to create 200,000 to 250,000 job opportunities, and that the company is prepared to train the fishermen to take up some of these jobs. Meanwhile, he said Forest City has been included as part of Iskandar Malaysia’s development since Jan 27. “We’ll be able to enjoy the incentives that fall under Iskandar Malaysia,” he said, adding that Country Garden Pacificview is in the midst of applying for these incentives, including its node Incentive Support Package. On the project’s financing, Md Othman said the company is currently relying on internal funding, but said it is also looking at obtaining further financing from local and international finance houses. In the meantime, Country Garden Pacificview is in the process of studying what products to launch, with the price range of these products expected to be known in two months. “In terms of pricing, I would say it will be comparable to the surrounding area. For the exact price range, we are still calculating it based on our financial model,” said Country Garden Pacificview head of strategic planning Yu Runze. Asked if there are concerns of oversupply, Yu said his study does indicate an oversupply in the residential segment, which is why the company has chosen to fashion the development into a mixed project. Md Othman said the concept behind Forest City is one of a “migration city”, so it will be fashioned to be a destination for buyers not only from Malaysia and Singapore, but elsewhere as well.